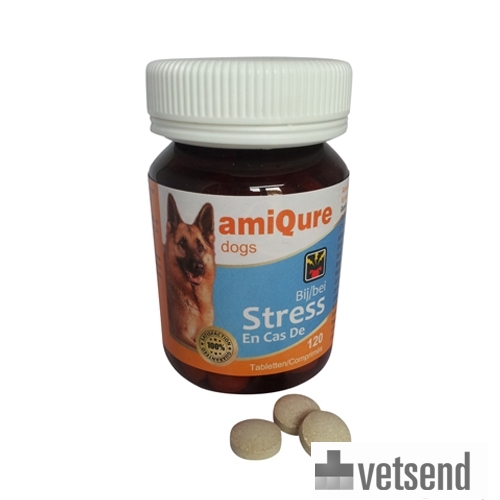 amiQure Stress for Dogs consists of high-quality, natural ingredients (food supplement) that reduce anxiety and stress in your animal. amiQure Stress makes your dog less susceptible to stress without making him drowsy. It is not addictive, so is suitable for long-term use. amiQure Stress makes your dog less susceptible to stress without making him drowsy. It is not addictive, so is suitable for long-term use. Problems such as adjusting, acceptance (e.g. a new pet), aggressive behaviour (outbursts, snarling), anxiety, hyperactivity, nervousness, intolerance, travel stress, tension, destructiveness and fear of fireworks. As with other amiQure products, the stress formula is based on a Multi-action system that focuses on the nervous system of the dog. For normal long-term use: give 1 tablet per 5 kg of body weight daily. For preventive use, e.g. when travelling, preferably start administering 5 to 7 days before the required date. Have you used amiQure Stress for Dogs before? Let us know what you think about this product. Unfortunately this product made no difference to my ESS who returned from a 3 day hospitalisation at the vets a completely different dog. Very stressed by so many things now and particularly noises. Very noise phobic now. Also I should like to know the composition of the product. Many products use the same ingredients so would be useful to know which ones are different.